In our £1,000,000 Ride 2007, all riders were almost invariably damp, often wet and frequently downright soaked. Not only that but they had to endure some winter-like temperatures, both in the UK and in France. The route included a Caen To Portsmouth crossing for the first time since 2000. On the last night we had a party in Caen Castle. We had hoped that this would be a fitting end to this milestone ride. We were not disappointed. The wine flowed all night and during much of the following days return voyage (courtesy of Brittany Ferries!). In the Ride Survey, Support was rated on average 10/10! This was a well deserved accolade for highly experienced support leaders John Adcock and Rod Elliott, as well as their dedicated team. 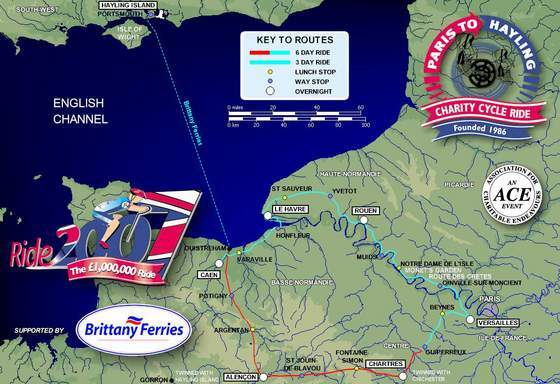 So after 22 summers the Paris to Hayling Cycle Ride had raised £1,000,000. It was difficult to grasp. In the local and national newspaper coverage of the Ride’s achievement significant attention was rightly given to the origin of the event and the sad death that had triggered it. Louise Burras parents like today’s organisers were so pleased that some good had come out of such a tragic event.